Dogs come in all shapes and sizes. One thing is true for all dogs, though — at some point, all dogs are going to get wet. Whether your dog needs an emergency wash after a close encounter with a mud puddle or it is just time for his regular monthly grooming, knowing how to clean your dog appropriately when wet is important. Your dog may enjoy being hosed down and lathered up — but many do not. Some dogs stress at the sight of a bath and put up a fight. Others hop happily into the tub. No matter what your dog’s take on water is, grooming your dog is a necessary and vital part of pet ownership. Besides keeping your dog healthy and happy, a regular bath allows you to spend quality time with your furry friend. Regular bathing builds a bond between the two of you and allows you to inspect your dog for health problems. Professional groomers are trained to handle dogs correctly from washing to drying, but you can save money and time by washing and drying your dog at home. Properly drying your dog is every bit as important as washing. Quickly drying your dog after a bath, a swim or even a quick outing in the rain makes him more comfortable and far less likely to accumulate dirt or debris. Many people let nature dry their dog, but that takes time and often brings those classic “wet dog” smells along with it. If you are wondering how to dry your dog at home, then know that the best solution is investing in a high-velocity dog dryer. The B-Air® Fido Max-1 dog dryer endorsed by Cesar Millan is the best home pet dryer on the market. B-Air® pet dryers are the top option for getting professional-grade equipment for home grooming. They are not just the fastest way to dry your dog. They’re also the safest for you to handle, and they’re the safest for your dog’s coat, skin and overall health. If you have never used a high-velocity dryer on your dog, he may be apprehensive when you start. The B-Air® Fido Max-1 is a quiet dog dryer, but there is still some noise associated with the electric motor and the rush of blowing air — that might be a source of stress for your dog. 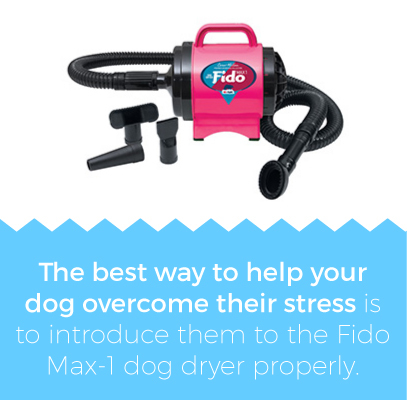 The best way to help your dog overcome their stress is to introduce them to the Fido Max-1 dog dryer properly. Dogs rely on their sense of hearing and smell far more than humans do. It is not possible for us two-legged creatures to fully understand the power of a dog’s nose and what it tells them. The same goes for a dog’s hearing. They are the front line of canine defense and are out ahead of sight, taste and feel. Dogs are also curious creatures. A dog is going to take an interest in something new to his surroundings, especially if that strange device is going to make physical contact with him while he is restrained. Turn the dryer on briefly and let it make ambient background noise. Use the lowest motor speed to create the least noise. Shut the dog dryer off and make more light noise by moving it about and letting the cord and hose touch the plastic housing. Then bring the attachments to your dog as he watches what you’re up to. Let him smell them. Talk to him and don’t be afraid to tell him what you’re doing. You, as a dog owner, know he is paying attention to the sound of your voice, and he trusts you. By showing him you are comfortable with the dryer and its attachments, you will quickly set him at ease that the dryer means no harm. Let him lick the attachments if he wants and gently rub them on his back and into his wet coat. Lightly massage him with your fingers, and then with the dryer tools. Let him familiarize with the dryer and dismiss it as a non-threat. Now, take the Fido Max-1 away to the other side of the room and start it up. Use the blower hose on yourself and run it up and down your arm or leg as your dog observes. Then, slowly bring it over and blow around your dog’s hind feet and up to his haunch. If he is hesitant or nervous, move back and let him settle. Once he is calm, re-introduce the dryer and repeat the slow introduction. With the sound of your calming voice and the soothing feel of air blowing into his coat, your dog should naturally relax, and you can move on to the next step in using your Fido Max-1 dog dryer. One word of caution in the introductory phase: Never blow air directly in your dog’s mouth, nose, eyes or ear canals. This goes for all phases of drying your dog. A dog’s ears are highly sensitive to noise and rushing air. Just like with washing your dog, though, you might find the biggest challenge in using the dog dryer is having him hold still. Fortunately, there are techniques to help keep your dog stationary. Very few dogs are going to stand still the first time they are exposed to the rushing air and new noise of a dog dryer. Even if he is an older, passive fellow, he is bound to move away from the force of blowing air until he gets accustomed to it and is sure that he is safe. Moving away is a natural reaction for a dog, and you are likely going to need some restraint. Tying your dog up is not recommended as the leash or harness is going to feel restrictive at a time when he wants to be free. Additionally, mechanical restraints are going to block your dog’s coat and hamper air movement, which is counterproductive to getting him dry. 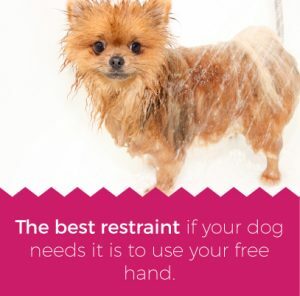 The best restraint if your dog needs it is to use your free hand. The Fido Max-1 dog dryer is ergonomically designed to be used with one hand, leaving your other one free to hold your dog or massage his coat as part of the drying process. There is no difference if you are right or left-handed as the dryer is intended for either. If your dog is a large breed, you may have him standing on the floor. In almost every situation where you are using a dog dryer, it is best for your dog to be standing up rather than lying on his back or side. It is much easier to manipulate the hose and massage his coat when you have access to all his sides. The same goes for smaller dogs, but they are going to be easier to turn and work their position in conjunction with the blower hose and attachments. You can hold your dog, while also making them feel safe and secure, by taking the arm that is not using the dryer and reaching over your dog’s back, under their belly, and placing your hand squarely on their chest. For smaller dogs, this may be easier on a raised platform, such as a sink counter or table. Agitated dogs are going to require a better hold than passive animals. A slight armbar around his neck or chest should be ample control. The grip is more to reassure him that he’s safe rather than keeping him from breaking loose. If he is severely distressed and afraid, it’s best to start the process over or wait until he’s calm. Most home grooming is done in the bathroom, laundry area, garage, or outside. Some pet owners use a table to set their dog on. That way, the pet owner can stand, rather than bending over, kneeling or squatting. Standing is often more comfortable, but it also provides better control. Avoiding distractions like other dogs or passing people helps to keep your dog calmer, too. Your washing and drying experience depends a lot on the relationship of your size to your dog’s size as well. If you have a good relationship and a firm understanding of who’s in charge, then size shouldn’t matter. If your dog is calm and comfortable with the dog dryer, then a tight hold won’t be necessary, and you can get on with the business of drying your wet dog. It is a simple process to use a dog dryer. 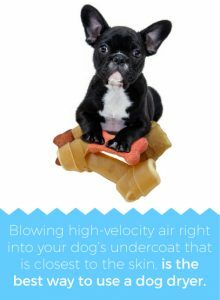 The principle relies on blowing high-velocity air right into your dog’s undercoat that is closest to the skin. Just running the dryer hose with various attachments on the outer hair does little actually to dry out your dog. That amounts to the same thing as toweling and air-drying. 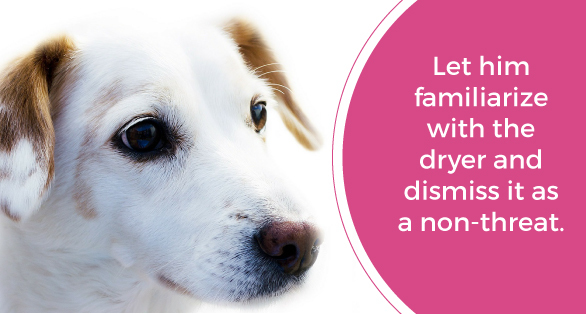 It is important to understand that quality dog dryers like the B-Air Fido Max-1 do not rely on heated air to evaporate water from your dog’s coat. They do not work as a human hair dryer, and for good reason. Dogs are much more sensitive to external heat than humans are and have a far more difficult time dissipating heat. Given this, and the fact that they cannot tell you when they are uncomfortable, heated dryers should never be used on your dog. The Fido Max-1 operates with high-velocity pressure that blasts water from his undercoat and sprays it up in the air like a dust cloud. You are going to get wet in the process, so it is best to wear suitable clothing — some groomers wear masks and goggles during the grooming process, and you can choose to do the same if you wish. Make sure you have towels on the table or floor to soak up any excess water. Start at the rear and take the hose upward from your dog’s legs to his rump and tail. Work slowly and see what he accepts. Work your fingers into his undercoat and gently massage his skin to free water. Blow against his hair grain and from his back to his front. Use short up and down strokes, watching for a pattern of water discharge. Concentrate in drying from the skin outward and avoid blowing the water back to the skin. Place the dryer hose directly against your dog’s skin. Use the Fido Max-1 attachments as you see fit, depending on your dog’s coat. Remember to keep air out of your dog’s mouth, nose, eyes and ears. Finish by drying the back of your dog’s head and pat his face dry if necessary with a small towel. Wet dogs are not the only ones who can benefit from the B-Air Fido Max-1 dog dryer. High-velocity air is great for blowing dirt, dust and all sorts of debris off dogs after they’ve been out for a walk or rolling around on the grass. Use the same procedure for drying a wet dog. Work from the back toward the front, and keep the air away from your dog’s face. It is also excellent to use a dryer on a dry dog just before you give them a bath. Blowing dust and dried dirt free from the coat before getting it wet can make the chore of bath time just a little easier. The Fido Max-1 attachments are designed to work with dry blowing as well as wet. Dogs come with two coat varieties — those who need to be clipped and those who shed their hair. If your dog is a shedder, you are often cleaning up clumps of hair and stray hairs all over your home. Did you know there is a way to reduce shedding? It’s called the de-shedding technique, and it works efficiently with the Fido Max-1 dog dryer. De-shedding is easy to learn and, if properly done, it lasts a long time and significantly reduces shed hair. Wash your dog with a shampoo designed for pets and rinse thoroughly. Apply de-shedding conditioner and rinse thoroughly. Rinsing is the key. Use the dog dryer until the coat is entirely dry. Do not stop until it is completely dry as sometimes the undercoat will not loosen when wet. Once the fur is dry, you can begin the de-shedding process. Use short back and forth motions close to the skin, starting again at your dog’s rear and working towards the head. Use a dog brush to remove the last of the shed hair. All B-Air® Fido Max-1 pet dryers come with four handy attachments to make your dog grooming chore easier. They also let your dog enjoy it, too. The airflow nozzle. This piece is designed to allow for more airflow, specifically for use with smaller dogs, cats, and sensitive areas, such as closer to the head and face. The brush nozzle. This attachment is designed to help with de-shedding your dog’s coat. The cone nozzle. This is used for the deepest drying and is ideal for dogs with thick coats. The slot nozzle. This attachment can help prevent knots from forming in the coats of longer-haired pets. Make sure you turn dog drying into a pleasant experience for both your dog and you. Many dogs love their Fido Max-1 high-velocity dryers and look forward to regular bath time. The feeling of rushing air from the dog dryer is a real treat, and there is no problem having them hold still as long as they enjoy it. The time spent using a Fido Max-1 solidifies the important bond between you and your dog, too. Add in some brushing and a little massage for your dog, and bath time may just become a favorite for you both.